Gathered under the heat of the Tucson summer sun, leading professionals in the field of science education and public outreach gathered to share ideas, communicate best practices, and form partnerships. The conference took place August 4-8 in Tucson, Arizona, USA. This conference, the latest in a series of annual conferences of the Astronomical Society of the Pacific, continued the Society's tradition of giving a forum for the many academics, practitioners, and enthusiasts of astronomy and science education and public outreach. 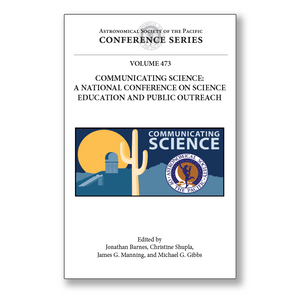 The theme of this conference was "Communicating Science," and the contents of the proceedings herein reflect the broad range of topics discussed and research presented. This volume includes discussions of the public perception of science in the wake of the rumored and anticipated Mayan Apocalypse of 2012, the latest in Astro 101 teaching and methods, an update on various public outreach projects around the world, notes on STEM efforts through astronomy, and many other subjects. The proceedings include some 70 contributions from leaders in the fields of astronomy education and public outreach.